The history of samplers in Europe extends probably from the end of the middle ages to the present time. 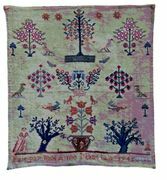 In the early second millennium embroidery was a pastime for the nobility and samplers were rather a pattern example and teaching device. In England the earliest mention of a sampler is an entry of the account book of Elisabeth of York (1502). The earliest German sampler is of the year 1618. 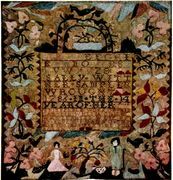 The earliest dated English sampler that survives could be the Jane Bostocke sampler dated 1598 (Victoria and Albert Museum London). The earliest forms of samplers in Europe were "spot samplers" and" band samplers". Band samplers are a lenght of fabric, mostly linen sometimes hemp or nettle, with bands of embroidery . The threads used for embroidery are often silk, metal or linen. Samplers were very popular in the 17th centuru but very few have survived . The Englidh influence is very strong. In the 18th century an American style, much more figurative than the English one,develops. American Samplers of the 19th century are very popular and original. How date and place samplers?